President Muhammadu Buhari, Tuesday appealed to the people of South East region not to buy into the idea of Biafra Republic promoted by the members of the proscribed Indigenous People of Biafra (IPOB). The president described the agitation for the realization of the sovereign State of Biafra as “a senseless propaganda” promoted by “some misguided youths” in the region. He said that dividing the country across ethnic lines is tantamount to betraying the efforts of Nigeria’s founding fathers. Buhari made the appeal while addressing the people of Ebonyi State at the Abakaliki Township Stadium. The president was on a one-day working visit to the state to commission some projects executed by the state governor, Chief David Umahi. “So, I am asking you all not to buy into the senseless propaganda on secession. 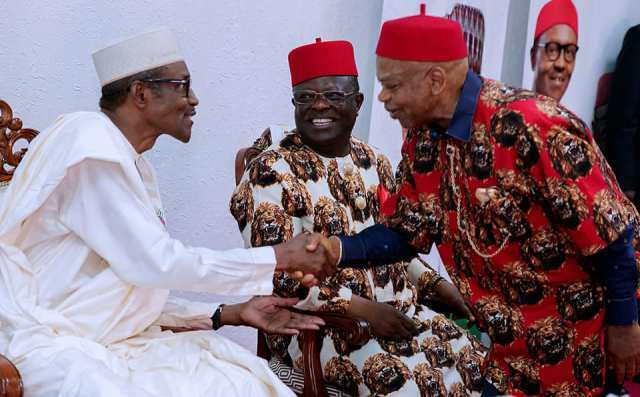 Igbo is Nigeria and Nigeria is Igbo, both are inseparable” the president declared. “We must, therefore, continue to commit ourselves to the development of Nigeria by sustaining our national unity without compromising our cultural identities. A Nigeria where the aspirations of its people is guaranteed without prejudice to tribe or religion, a Nigeria where we can sleep at night knowing that tomorrow will be better than today is what we should all aspire to. “The task of nation building is continuous, our founding fathers from all parts of this country worked together to actualize the creation of one Nigeria. After Independence, the same founding fathers worked together to maintain this one Nigeria. “Yes, they had differences of opinion at times; after all they were only human. And yes, they had moments of weaknesses and doubt but again no one is perfect. However, one thing they all protected until the end of their lives was having one Nigeria for all Nigerians. Today Nigeria is 57 years old. Nigeria has gone through many pains but has also achieved significant successes.